To celebrate Global #Zinfandel Day, I decided to open something special, something unusual–something from Australia to toast the 47th birthday of my Australian friend and fellow blogger Paul Squires who had a heart attack and died July 28, two days before my mother died of heart failure. Paul was one of my strongest supporters as a blogger, as a writer, and as a poet. He was my online buddy with whom I could plot and scheme and strategize. We shared links and ideas and gave each other feedback on many elements of social media and writing. So when I realized that Global #Zinfandel was his birthday, I knew I’d be drinking one of the two Australian zinfandels in the cellar my grandfather built, wines that Grateful Palate founder Dan Phillips selected for me at one of his warehouse sales. It was a toss-up between the Rusden (on sale for $29.99–probably retailed at 3x that amount, around $75) and the Glaymond by Damien Tsharke ($26.99–again probably retailed at $75); I’m not sure exactly how I decided between the two because I tweeted at first that I was drinking the Rusden when it was actually the Glaymond! That day at the warehouse sale, Dan told me so many great stories about the case or so of wines I bought and the characters in the Barossa Valley making the wines and the immigrant families who have been tending the grapes and the land for many generations. Unfortunately, that’s where those stories remain: in his head because the website is bereft of any information (lots of 404 errors). While I was really tempted to compare the two AUS zins and open them both, I’d decided that Global #Zinfandel Day would be the perfect time to open and taste the Bianchi Zen Zin that they had sent me in July. Bianchi had contacted me to ask if I wanted to come up and interview winemaker Tom Lane, and I’d suggested that I run a contest to see who else might want to join me in the excursion. Since I knew it was going to be quite a night in the wine department, my husband grilled a rack of lamb which he seasoned with fresh rosemary, salt and pepper rub. We also had brown rice, broccoli, and a green salad. My husband and the Glaymond hit it off big time, and it was a great match with the lamb; I had to practically wrestle him to get some. It had a cork closure and 15.4% alcohol that was so well balanced that I was very surprised that it wasn’t lower. This was Damien Tsharke’s first outing with zinfandel; subsequent vintages he moved from the Glaymond label to the Tsharke one. I’d had some of his wines under the Tsharke label–good solid efforts, but not my favorite wines, and there’s a montepulciano in the cellar I’m curious about. Does it really matter what a varietal is when it’s this good? So good that after dinner when I went to pour some in my glass and take some serious notes, it was all gone! I commandeered what was left in my husband glass to share what I got! But this zinfandel from Australia didn’t scream zinfandel to me. Awesome yes, but zinfandel? No. Not to this American. The Bianchi was gentle, feminine even. While I would hesitate as to go so far as to say it was delicate, this might be the zin for the pinot noir lover. It’s medium bodied, well balanced and structured, with a nice red color and raspberry fruit to match plus some spiciness. I actually think duck would pair well with it or even better turkey–this wine would make an excellent selection for Thanksgiving dinner plus the bottle would be impressive on the table. In fact on Sunday night I enjoyed the last glass of the Bianchi zin with an early turkey feast which we roasted on the grill–and this pairing was out of this world! Something connected between the turkey, which had been brined and cooked with a can of beer inside, and the Bianchi, and next thing I knew, the wine was gone and my notes were too! The magic combo brought out the richness and herbs of the turkey and the fruit in the wine. 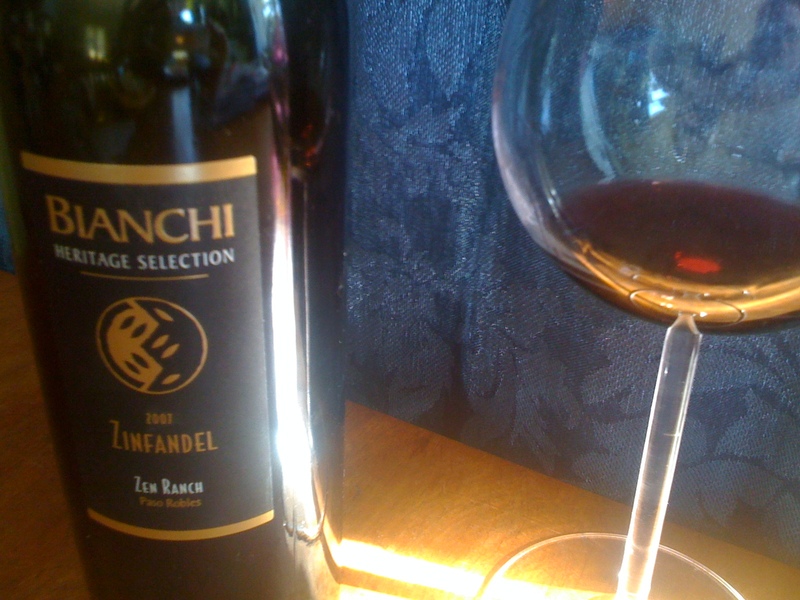 The Bianchi Heritage Selection 2007 Zen Ranch Zinfandel retails from the winery at $26. If you’re curious, “like” them on facebook and watch their page for a 20% off coupon. It used a real cork closure and has a alcohol content of 15.4%–which I was surprised to discover because the wine is so well balanced. I am so looking forward to heading up there with a few “choice” friends and meeting winemaker Tom Lane! If you want me to “choose” you, tell me why! ← Part 1: Global #Zinfandel Day = Zin-tastic!